The plan was to arrive the day before, but thunderstorms and a forecast for icing prevented the flight from Livermore to Minden as planned. As a result, I flew up the next morning after the storm had passed. I arrived at 9 am to find three gliders and the local tow plane staged at the Rwy 34/30 intersection. After emptying the tow plane of everything that wasn’t tied down, so as to be as light as possible, I received a briefing of the local procedures. Since there were three gliders, each had a designated area for towing to, for de-confliction. Winds favored 34 and before I knew it I was waved onto the runway by the ground crew. I made my radio call “CAP 483, taking runway 34 for glider hookup and tow” and lined up in front of the glider. The ground team hooked up the tow rope and the glider pilot called over the radio to take up slack. Then with a wag of his rudder he signaled he was ready to go. Another radio call, and off we went. Right away, the glider pilot radioed to slow down, he was indicating 68 knots, although I was indicating 63. I pulled back to an indicated 60 knots. Altitude gain was slow and the ride was bumpy as we circled over the airport to gain altitude to avoid dragging the glider too far away from the airport before we had sufficient altitude. We continued eastbound as I tried to maintain a consistent airspeed in the turbulence. The glider was bounding around as well. Several times I wondered if they were “boxing” the wake, or trying to drag my tail around to signal a turn. 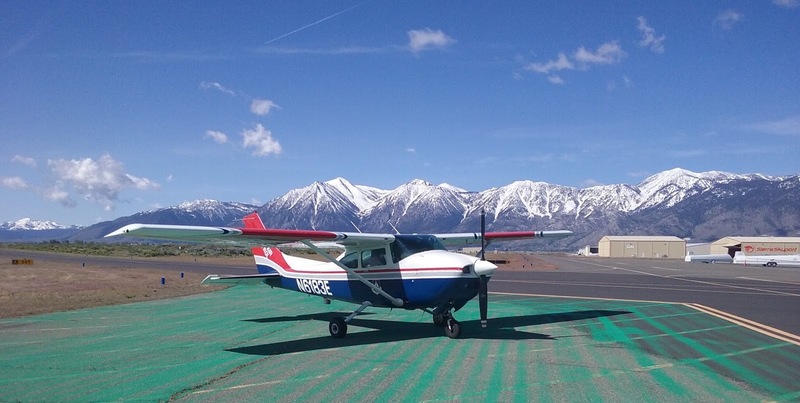 We arrived at the schoolhouse with the purple roof below the requested altitude of 7700 ft, so I commenced circling when at about 7500 ft my airspeed when to “0”. We had just hit a good amount of sink. I pointed the nose down and contemplated releasing, but the glider pilot beat me to it. I dived back towards the airport, made my radio calls and made an uneventful landing on 30. Winds had died down now, and were favoring 30, so ops moved to the large ramp next to 30. I shut down and waited for the next tow. Towing from the 30 ramp is different because gliders stage off to the side of the runway. As a result, we were not lined up with the centerline. This took some getting used to. The next glider pilot tested my knowledge of the signals by making no radio calls. I watched the ground crew to know when to take up slack and when to stop. Then I watched for the wing to be raised and the rudder wagged from the glider to know when he was ready. Off we went, down the runway, the tow plane bouncing off the runaway as we crossed the 34 intersection. A left 270 departure and we headed southeast to the drop off location for this glider. I ran into lift (indicated by an increase in airspeed without control movement) on the way so I circled back for the free ride. We climbed, first 1000 ft/min, then 1500 ft/min. In no time, we were at the requested 7700 ft. The glider released, and I returned to the airport and waited for the next tow. As the day progressed, winds, turbulence, up and down drafts increased, and on one takeoff I found myself contemplating releasing shortly after liftoff as the plane was not climbing. In fact, it was returning to the runway. This went on for several seconds as I reached for the release when suddenly we hit an updraft, and up we went. On this same tow, nearing the drop off location, altitude gain stagnated as I circled around for several minutes searching for lift while the VSI was flat. I decided to give up on this area and fly out northeast. Finally, we found some lift and we were able to climb up to 7700 ft and release the glider. The high altitude and mountain towing challenges continued throughout the two days. My mountain flying training and limited glider experience proved invaluable in providing safe, consistent, and efficient tows. After two days and 19 tows I finally got my turn to fly the glider. 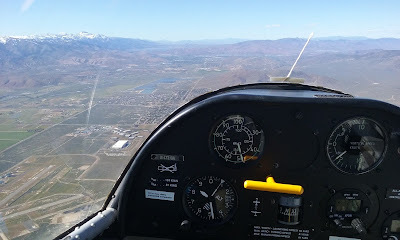 Having four prior glider flights, the instructor let me have the controls for the entire time. After a challenging crosswind takeoff, and bumpy ride up, we released at 8000 ft. I unsuccessfully hunted around for lift. It seemed things had died down for the day. But then, just as we were setting up for a downwind to land, we caught the edge of a thermal. I quickly banked to remain in the thermal and watched the vario go from 1 to 2 to 10 knots up! Another glider joined us in the ascent and soon we were at 10,000 ft with a glimpse of Lake Tahoe. The thermal topped out and we again hunted around unsuccessfully for lift. I decided to return to the scene of the crime, and as before, when setting up to land, we caught another thermal and rode it up to 9500 ft where it waned again. I wasted no time going back to the origin and caught it again! We probably could have ridden it again and again, but after an hour and 15 minutes we decided that the ground crew probably wanted to go home. What a great way to cap off two great days of towing! Click here for a story from a TV station in Reno. And more media coverage here. Nice work, Capt Gast and Lt Choate! I gave over 7 hours of instruction, including a 1.7 hour instructional flight (check out the flight trace on Squadron 188’s Facebook page). 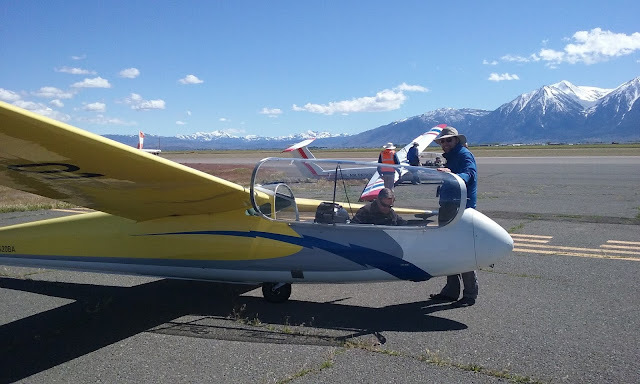 I signed off Lt Col Richard "Durk" Gerhardt of CAP-USAF to make his initial glider solo; he and Col Sammy Pierce (the vice commander of CAP-USAF) both made initial glider solos on day two. Col Pierce showed up without the intention of soloing, but he decided we were infectious and he just "had to" make it happen. 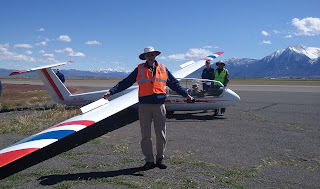 I flew 16 of the 49 glider flights over two days. 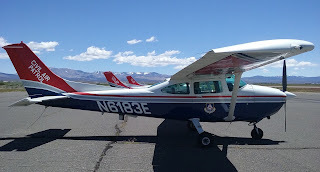 Lt Choate towed for 19 of the 49 glider flights, and received compliments from several of the USAF pilots in the glider for his consistent airspeed in turbulent conditions. He is an excellent tow pilot. I'll follow him anywhere! The PAO-based SUV towed N420BA, the Byron-based glider, from Minden to Carson City for its annual and miscellaneous repairs. Aerotow is hard to master, and it's a lot like air-to-air refueling (an observation first made to me by Squadron 188's Maj Mark Fridell, who is far better at aerotow than he has a right to be given how few glider flights he's taken). I asked everybody what kind of flying they had previously done. More than half had done air-to-air refueling. Minden-Tahoe Airport (MEV) has two runways generally used by gliders - the paved runway 30, and a dirt runway 30G. On one flight, I was setting up to land in the dirt because there was staging on the paved runway 30. My USAF student asked if we could land in the dirt because he'd "landed a lot of C-17s that way." So we did! If you get to 9,000 feet, you can see Lake Tahoe over the Carson Range.